the special right triangle called the 30°-60°-90° triangle. how to prove that the ratios between the sides of a 30-60-90 triangle are 1:√3:2. Recognizing special right triangles in geometry can help you to answer some questions quicker. A special right triangle is a right triangle whose sides are in a particular ratio. You can also use the Pythagorean theorem, but if you can see that it is a special triangle it can save you some calculations. The 30°-60°-90° triangle is one example of a special right triangle. It is right triangle whose angles are 30°, 60° and 90°. The lengths of the sides of a 30°-60°-90° triangle are in the ratio of 1:√3:2. The following diagram shows a 30-60-90 triangle and the ratio of the sides. 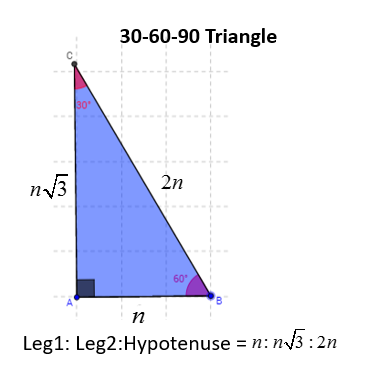 Scroll down the page for more examples and solutions on how to use the 30-60-90 triangle. The hypotenuse is always twice the length of the shorter leg (the side facing the 30° angle). The longer leg (the side facing the 60° angle) is √3 times of the shorter leg. Find the length of the hypotenuse of a right triangle if the lengths of the other two sides are 4 inches and 4√3 inches. Step 3: Calculate the third side. Answer: The length of the hypotenuse is 8 inches. You can also recognize a 30°-60°-90° triangle by the angles. As long as you know that one of the angles in the right-angle triangle is either 30° or 60° then it must be a 30°-60°-90° special right triangle. A right triangle with a 30°-angle or 60°-angle must be a 30°-60°-90° special right triangle. Find the lengths of the other two sides of a right triangle if the length of the hypotenuse is 8 inches and one of the angles is 30°. This is a right triangle with a 30°-60°-90° triangle. You are given that the hypotenuse is 8. Substituting 8 into the third value of the ratio n:n√3:2n, we get that 2n = 8 ⇒ n = 4. Substituting n = 4 into the first and second value of the ratio we get that the other two sides are 4 and 4√3. Answer: The lengths of the two sides are 4 inches and 4√3 inches. How to solve a 30-60-90 triangle given the length of one side? This video discusses two special right triangles, how to derive the formulas to find the lengths of the sides of the triangles by knowing the length of one side, and then does a few examples using them. Proving the ratios between the sides of a 30-60-90 triangle are 1:√3:2.